The College has a fully computerized spacious library with over 4609 Books having separate reading room facility for staff and students. 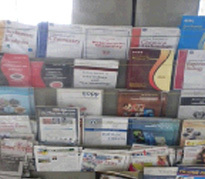 It has numerous reference books, National and international journals and Book- bank facility for students. The library is the computerized through LIBMAN software and books are bar- coded. The students can search the books subjectwise as well as outhorwise with the help of computers. The Reading room of library is kept open even after College working hours.